Figure 4. Chapel of Mary and the Angels, Monastery of Christ the Saviour, CSWG, Hove. This shows the so-called ‘corona’ suspended above the altar, itself octagonal. The icons were sometimes changed according to the liturgical seasons. The inside of the screen has icons of saints and angels, with Rublev’s Trinity at the eastern end. 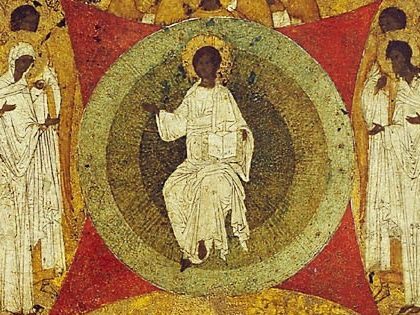 This icon serves as a focus, both as it were of the saints and angels, and also for the worshiping community here on earth. When the worship area was first reordered (1985–6) the pews were reused. After having first been removed (wrenched!) from their original siting, they were rearranged, two-deep, in large octagonal shape around the altar. Subsequently (around 2002) chairs replaced the pews. The chairs were marginally more comfortable, but perhaps something was lost when the pews went. Although I believe there is little to be said for pews when they stand in serried ranks, dozens deep, so that the immediate focus of attention for most of the congregation is the back of the heads of the rows in front, nevertheless, when the pews are in the kind of arrangement in which they were at St Patrick’s (only two-deep) no one is left looking at the backs of countless heads, there is perhaps this rather subtle advantage that pews have over chairs: there is something more ‘communal’ and less individualistic about pews than chairs.